Fiftieth reunioners David Leipziger, Kitty Beer, and Howard Kristol, J.D. ’62. 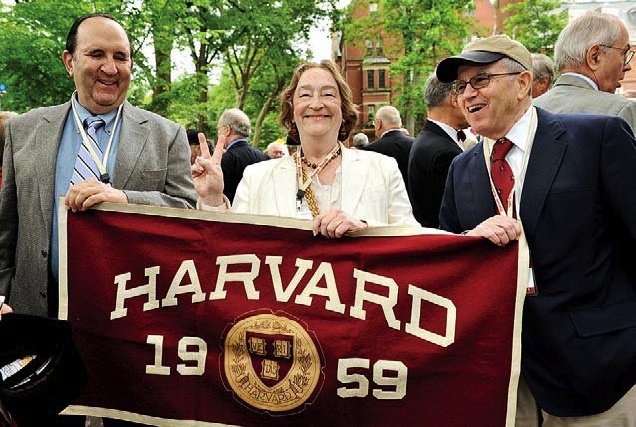 The University comprises many things —buildings, history, and world-renowned professors—“but it is the alumni who help make Harvard what it is today,” said University Treasurer James F. Rothenberg ’68, M.B.A. ’70, on June 4. He spoke of alumni contributions at the HAA’s annual meeting, taking a moment to commend in particular long-time Harvard supporter Albert H. Gordon ’23, M.B.A. ’25, LL.D. ’77, of New York City, who died recently at the age of 107. Rothenberg went on to report that the class of 1984 had donated nearly $31 million as their twenty-fifth reunion gift, and the class of 1959 gave almost $21 million. Though departing from past years’ practice of listing other class gifts and totals, he did note the senior class gift participation rate hit a record-breaking 74 percent, while the class of 1999 set a new tenth-reunion fundraising record.